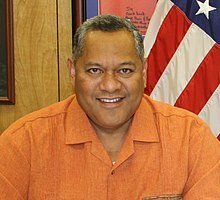 In October 2011, gubernatorial candidate Lolo Letalu Matalasi Moliga picked Mauga as his running mate for Lieutenant Governor of American Samoa in the forthcoming 2012 gubernatorial election on November 6, 2012. Mauga is the current Lieutenant Governor of American Samoa, being elected in 2012 and re-elected in 2016. ^ a b c d e f Sagapolutele, Fili (2011-10-19). "Lolo and Lemanu declare their candidacy for governor and lt. governor in the 2012 general election". Samoa News. Archived from the original on 2013-10-29. Retrieved 2012-11-06. ^ Feagaimaalii-Luamanu, Joyetter (2012-08-01). "Historic Double Cohort Yesterday Awards 51 Masters Degrees". Samoa News. Archived from the original on 2012-08-03. Retrieved 2012-11-06.